Gearing up for your big presentation? 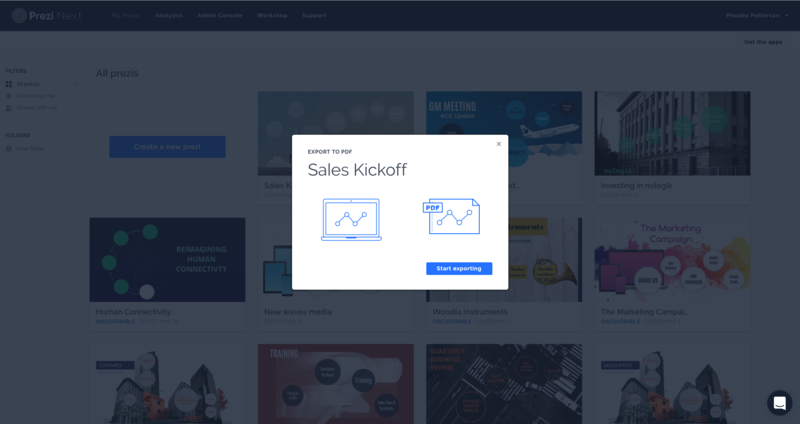 Prezi Next comes with an arsenal of features to keep your presentation on-message and running smoothly. That way, when you step on stage, you can forget the stress and focus on conversational presenting with your audience. Prepare, present, engage. 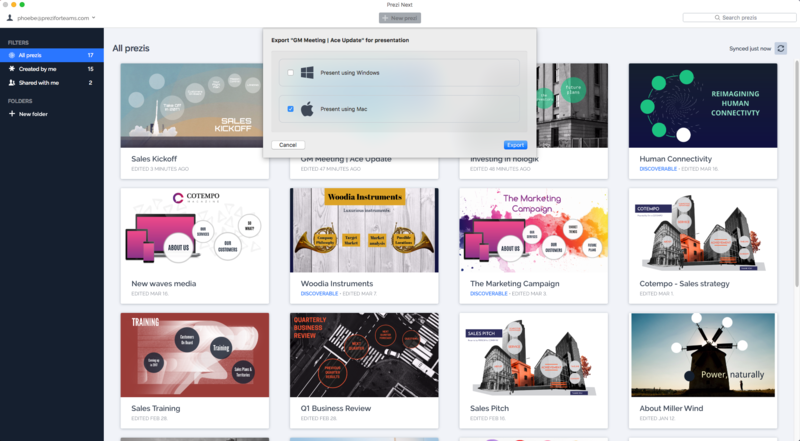 Paid features: The presenter features shown in this article are available for users with a Plus or higher Prezi Next plan. Luckily it’s a breeze to upgrade your license and get access to this and all the other great features our Prezi plans have to offer. Presenter view is a separate display in the desktop app that shows where you are in your presentation and what’s coming next. It can also time your progress and keeps presenter notes on-screen and updated in case you need a cue. Sometimes we all need a heads-up. Don’t freeze on stage, use presenter notes to record your ideas and reminders and then revisit them while presenting. Leave your audience with more than a lasting impression by sharing a PDF version of your presentation. Export your presentation to a printable PDF file and you can share it in-person or via email. Use the desktop app to download your presentation to a standalone file that’s viewable even without an internet connection. Store it on a USB drive or send it in an email. It’s a great way to have a backup when presenting in a world of unreliable internet. You can’t be everywhere at once. Luckily, with Live Prezi you can present to anyone, from anywhere, in the world. Create a personalized presentation space and invite up to 100 audience members to join remotely and in real time by sending your own unique link. Did you know your phone or tablet can double as a presentation remote? Navigate your presentation on your phone or tablet with the Prezi Viewer app so you can focus on conversational presenting while having the freedom to move around the stage and engage your audience.